The sensational BBC hit that’s been beating up Vanity Fair in the British ratings will premiere here on Netflix. Netflix hasn’t announced a date for the Jed (Bodies, Line of Duty) Mercurio thriller starring Spooks’ Keeley Hawes but presumably it will be an October highlight, as it will have completed its BBC run by then. Netflix co-funded the ITV production, which has been delighting critics and viewers alike in the UK, and so owns the global rights. “Anyone hoping for relaxingly cosy bank holiday weekend viewing – a lavish period drama, perhaps, or a picturesque rural whodunit – would have been shocked out of their sofa stupor by Bodyguard (BBC One),” The Telegraph said. In Bodyguard, Mercurio trains his eye and his nose for corruption on the corridors of power and, by the end of last night’s opening episode, it was clear he has created something as dark and moreish as ever. As the credits rolled, I snouted for more like a truffle-hunting pig. 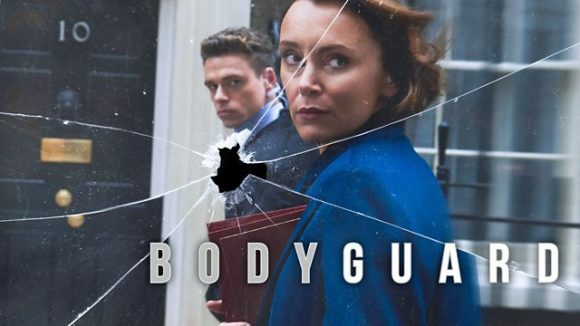 “What makes Bodyguard so unsettling is that it’s grounded in reality – events that take place could happen. Have happened,” Metro said. It’s typical of Mercurio – long takes, close-ups of frantic expressions, silences saying more than words. And the horror, although it is averted, takes place on something as mundane as a train journey, something millions of us do every single day. The good news for Netflix subscribers is the series should stream in 4K; if you’re not a Netflix subscriber, it’s on the BBC iPlayer. Cheers, Phil! Will watch if it’s on next month.